This Superb Parking garage is equipped with 3 levels of parking space, a tower with working lift and a helicopter landing platform. With its open sides, small hands can maximise their imaginative play. 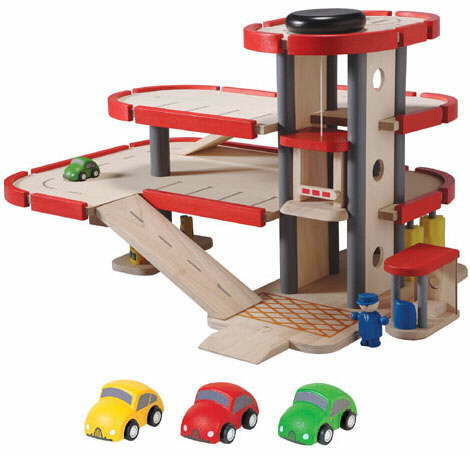 The children’s wooden car park set includes 4 wooden cars, comprising 2 green, 1 red and 1 yellow car, a petrol station, car washing machine, parking attendant. The design is scaled to accommodate other metal, die cast or plastic vehicles. Send cars and trucks whizzing up and down the ramps, not forgetting to pay the parking attendant as you exit. Oh, and you may as well get the car washed whilst you can. A wonderful play centre that brings a child's imagination to life. All timber is sanded and sealed with lacquers or brightly painted, with road lines marked. Made from high quality rubberwood and MDF. Supplied flat packed with full instructions for adult assembly.